Our father among the saints John (Maximovitch), Archbishop of Shanghai and San Francisco (1896-1966), was a diocesan bishop of the Russian Orthodox Church Outside Russia (ROCOR) who served widely from China to France to the United States. He departed this life on June 19 (O.S.) / July 2 (N.S. ), 1966, and was officially glorified by the Russian Orthodox Church Abroad on July 2, 1994. 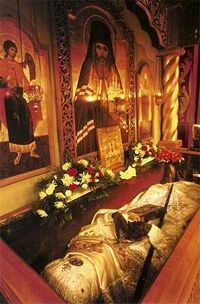 His glorification was later recognized for universal veneration by the Patriarchate of Moscow on July 2, 2008. The future St. John was born on June 4, 1896, in the southern Russian village (current day Ukraine) of Adamovka in Kharkov province to pious aristocrats, Boris and Glafira Maximovitch. He was given the baptismal name of Michael, after the Holy Archangel Michael. In his youth, Michael was sickly and had a poor appetite, but he displayed an intense religious interest. He was educated at the Poltava Military School (1907-14), Kharkiv Imperial University, from which he received a law degree (in 1918), and the University of Belgrade (where he completed his theological education in 1925). He and his family fled their country as the Bolshevik revolutionaries descended on the country, emigrating to Yugoslavia. There, he enrolled in the Department of Theology of the University of Belgrade. He was tonsured a monk in 1926 by Metropolitan Anthony (Khrapovitsky) of Kharkov (later the first primate of the Russian Orthodox Church Outside of Russia). Metr. Anthony later in 1926 ordained him hierodeacon. Bishop Gabriel of Chelyabinsk ordained him hieromonk on November 21, 1926. Subsequent to his ordination he began an active life of teaching in a Serbian high school and serving, at the request of local Greeks and Macedonians, in the Greek language. With the growth of his popularity, the bishops of the Russian Church Aboard resolved to elevate him to the episcopate. Hieromonk John was consecrated bishop on May 28, 1934, with Metr. Anthony serving as principal consecrator, after which he was assigned to the Diocese of Shanghai. Twelve years later he was named Archbishop of China. Upon his arrival in Shanghai, Bp. John began working to restore unity among the various Orthodox nationalities. In time, he worked to build a large cathedral church that was dedicated to Surety of Sinners Icon to the Mother of God, with a bell tower and large parish house. Additionally, he inspired many activities: building of churches, hospitals, and orphanages among the Orthodox and Russians of Shanghai. He was intensely active, constantly praying and serving the daily cycle of services, while also visiting the sick with the Holy Gifts. He often would walk barefooted even in the coldest days. Yet to avoid the appearance of secular glory, he would pretend to act the fool. With the end of World War II and the coming to power of the Communists in China, Bp. John led the exodus of his community from Shanghai in 1949. Initially, he helped some 5,000 refugees to a camp on the island of Tubabao in the Philippines, while he travelled successfully to Washington, D.C., to lobby to amending the law to allow these refugees to enter the United States. It was while on this trip that Bp. John took time to establish a parish in Washington dedicated to St. John the Forerunner. In 1951, Abp. John was assigned to the Archdiocese of Western Europe with his cathedra in Paris. During his time there, he also served as archpastor of the Orthodox Church of France, whose restored Gallican liturgy he studied and then celebrated. He was the principal consecrator of the Orthodox Church of France's first modern bishop, Jean-Nectaire (Kovalevsky) of Saint-Denis, and ordained to the priesthood the man who would become its second bishop, Germain (Bertrand-Hardy) of Saint-Denis. In 1962, Abp. John was assigned to the Diocese of San Francisco, succeeding his long time friend Abp. Tikhon. Abp. John's days in San Francisco were to prove sorrowful as he attempted to heal the great disunity in his community. He was able to bring peace such that the new cathedral, dedicated to the Joy of all Who Sorrow Icon of the Mother of God, was completed. Deeply revering St. John of Kronstadt, Abp. John played an active role in preparation of his canonization. He reposed during a visit to Seattle on July 2, 1966, while accompanying a tour of the Kursk-Root Icon of the Mother of God. He was laid to rest in a crypt chapel under the main altar of the new cathedral. Orthodox Veneration of Mary, the Mother of God, written by St. John the Wonderworker himself, published with a foreword by Seraphim Rose. Homilies and Other Writings of Saint John the Wonderworker of Shanghai and San Francisco. This page was last edited on June 6, 2015, at 07:07. This page has been accessed 146,183 times.